For the last 10 years, RayCom has invested in Gas station systems with particular attention. The official beginning took place in 2003 with the introduction of fiscal processors in the invoicing systems. Then, in 2009, the mandatory application of cash registers resulted in a very strong presence of RayCom in the Northern Greece market, since alongside the simple cash management solutions the company installed gas station management systems in dozens of gas stations in Northern Greece with its successfully organized technical department. Pump Management System (quantities and types of fuel, prices per category, employers' shifts, automatic / manual operation of pumps, reports, prints, etc.). Volumetric Control System of tanks with gas probes. 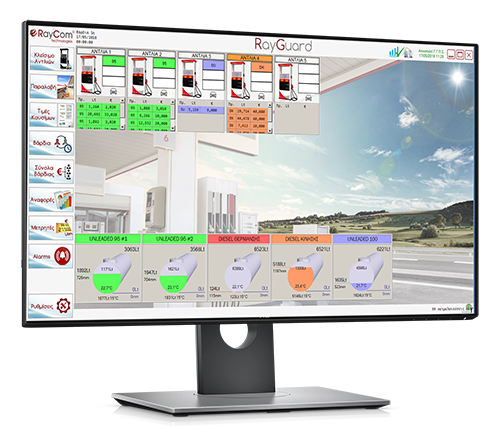 Fuel Retailing and Invoicing software: Sales Management Systems for the mini market (Billing - Retail receipts). Self Service Refueling Terminals (OPT) with credit cards and cash. i-Button: user encoding system pumps. Monitoring and recording of station premises (CCTV surveillance). Remote surveillance system and station management. Electronic System for Fuel transfer supervision with tankers. ERP applications for monitoring the fiscal books of the gas station. Mobile Billing System for diesel distributors. In recent years there has been a large number of successful installations. Thus, in every part of Greece there are installed systems which reveal our expertise and the quality of our cooperation with the client.